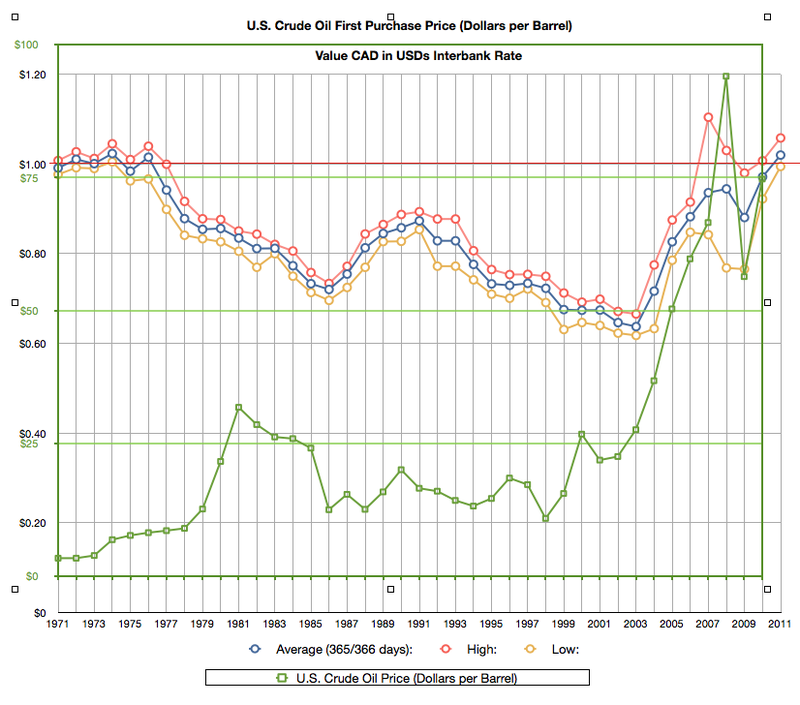 Combined graph showing relation between CAD dollar value and Oil prices. 31 May 1970: Canadian dollar floated. Canadian Proven Oil Reserves where Dramatically increased in 2003 with the Inclusion of Athabasca Oil Sands. 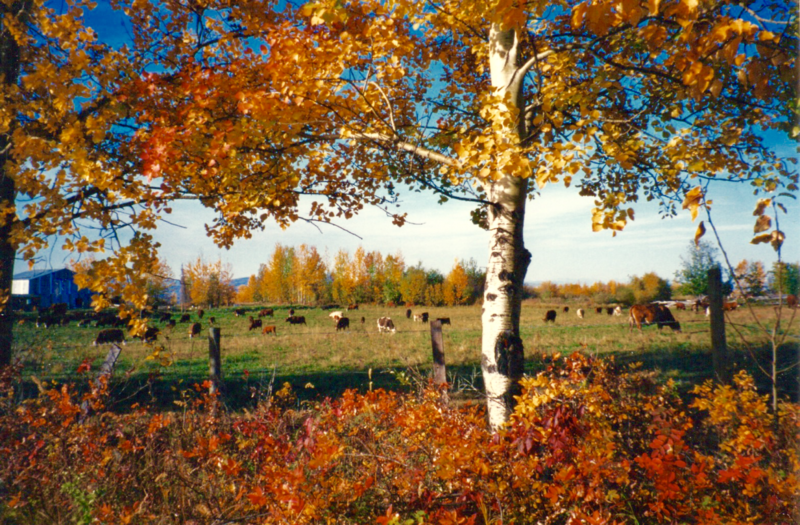 Canada’s proven oil reserves dramatically increased in 2003 with the inclusion of Athabasca oil sands. Higher values for extracted resources—particularly when Canada is second only to Saudi Arabia [excluding Venezuela undeveloped oil sands] in oil reserves— should be good news for Canada but history has shown us that is not always the case. There are certain economic hazards that need to be recognized and addressed to avoid a Canadian structural recession. Canada’s oil production in 2008 was 1 billion barrels per year and is expected to increase rapidly over the next 10 years to 1.75 billion barrels per year oil sands. The value of the Canadian dollar exchange rate rise and falls. 85% of the influence comes from price of oil in excess of the cost of production. 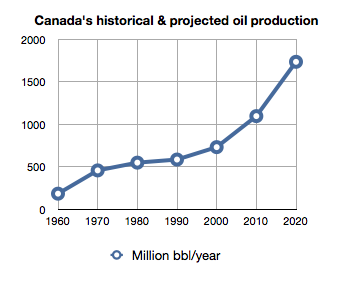 The approximate value of Canada’s oil production was 750,000,000 barrels in 2000. If you multiply this volume by the average price of oil in 2000 which was $30.37 per barrel that would make the annual value of Canada’s oil production $23 billion. This figure would rise to $86 billion in 2010 with the world price at $78.10/br. In 2020 Canada’s annual oil production is expected to rise to 1,733,000,000 barrels which would generate $184 billion in value assuming the world price of oil stays the same at around $104 per barrel. Click on the map to see a full page view. If action is not taken to deal with the down sides of a sudden and rapid rise in oil prices followed—after enough years to develop structural changes to our economy and government policy—by a sharp and prolonged price decline. The increase in value of the Canadian currency in exchange markets has already put a strain on manufacturing exports—complicated and and to a certain extent obscured by the recent subprime crisis in America. Should Canada install a solution that is an automatic mechanism or some form of regulator—similar to the Bank of Canada’s control of the prime interest rate—that would stabilize the effect of world oil market fluctuations. With election debate on the economy currently prevalent in Canada this might be a good time to ask if the Canadian Government has been on the right track. But first we must determine what internal and external changes have recently taken place that could affect our decisions for the future economic—and therefore social—wellbeing of our country. If Canada does have problems in the near future it might be because we did not fully appreciate the world economic situation (like we were blissfully unaware about the looming subprime crisis in 2007 that triggered the resent world economic crisis). These are the conditions that I think would cause the sudden an adverse effect if the the world price was too suddenly drop back to the more stable $30 a barrel range. World oil prices have risen from traditional $20-$30 range to $100-$110 range trending upwards since 2000. The Canadian dollar has trended upwards on currency exchanges. (chart needed). Agriculture and manufacturing have decreased. (citation needed). Government spending annual deficits have risen. Corporate tax has been trending downward. Canadian productivity was in decline but is in recovery Ranked 3rd in G20 now 15th (Mark Carney Bank of Canada Monetary Policy Report 13 April 2011). The gap between rich and poor widening. What party policies should we be looking for to deal with the problems caused by increased rents? “The term was coined in 1977 by The Economist to describe the decline of the manufacturing sector in the Netherlands after the discovery of a large natural gas field in 1959. In economics, the Dutch disease is a concept that purportedly explains the apparent relationship between the increase in exploitation of natural resources and a decline in the manufacturing sector. The claimed mechanism is that an increase in revenues from natural resources (or inflows of foreign aid) will make a given nation’s currency stronger compared to that of other nations (manifest in an exchange rate), resulting in the nation’s other exports becoming more expensive for other countries to buy, making the manufacturing sector less competitive. This economic phenomenon is not new and Wikipedia continues to explain the Dutch disease model—again italic formatting has been added for emphasis. “In the model, there is the non-traded good sector (this includes services) and two traded good sectors: the booming sector, and the lagging sector, also called the non-booming tradable sector. The booming sector is usually the extraction of oil or natural gas, but can also be the mining of gold, copper, diamonds or bauxite, or the production of crops, such as coffee or cocoa. A resource boom will affect this economy in two ways. the resource boom will increase the demand for labor, which will cause production to shift toward the booming sector, away from the lagging sector. This shift in labor from the lagging sector to the booming sector is called direct-deindustrialization. However, this effect can be negligible, since the hydrocarbon and mineral sectors generally employ few people. The “spending effect” occurs as a result of the extra revenue brought in by the resource boom. It increases the demand for labor in the non-traded good sector (this includes services), shifting labor away from the lagging sector. This shift from the lagging sector to the non-tradable sector is called indirect-deindustrialization. As a result of the increased demand for non-traded goods, the price of these goods will increase. However, prices in the traded good sector are set internationally, so they cannot change. This is an increase of the real exchange rate. In simple trade models, a country ought to specialise in industries in which it has a comparative advantage, so theoretically a country rich in natural resources would be better off specialising in the extraction of natural resources. In reality, however, the shift away from manufacturing can be detrimental. If the natural resources begin to run out or if there is a downturn in prices, competitive manufacturing industries do not return as quickly or as easily as they left. This is because technological growth is smaller in the booming sector and the non-tradable sector than the non-booming tradable sector. Since there has been less technological growth in the economy relative to other countries, its comparative advantage in non-booming tradable goods will have shrunk, thus leading firms not to invest in the tradables sector. 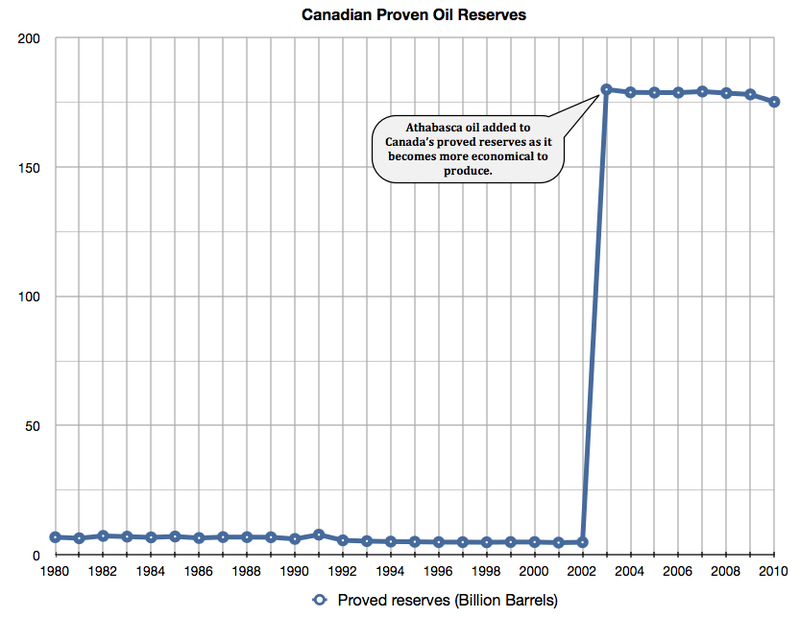 This graph shows the total Value of Canada’s Proven Oil Reserves with a moving 4 year average trend line. The graph puts together Canada’s current estimated Proven Oil Reserves in barrels with the changing average annual WTI price per barrel of oil. This should give us the approximate change in the total value of Canada’s proven oil reserves.